Back at the beginning of December, my son left home to join the Navy. When he enlisted, we knew he would be attending basic training north of Chicago. We also knew, based on the fact that he would be pursuing a Master-at-Arms career track, that his next training would immediately follow that in Texas. What we didn’t know was where they would send him next. That question mark was huge, and it’s been on my mind daily since before he left. Six weeks here and six weeks there is one thing, but the next two to three years is a big deal, and I really just wanted to know where my youngest child would be. Once a mom, always a mom. We all got to exhale this week, because we now know where he’s going after his leave in April…Italy! He’s very excited, and my husband and I are already looking forward to visiting him there. Giving my baby up to the military hasn’t been easy, but having a great excuse to travel to Italy is definitely a perk! Because we’re a Navy family now, I’m all about all things anchor. I’m trying not to go crazy filling the house with them, but there’s a quote I love that I thought was perfect for the situation and MUST have an anchor with it. I actually bought the supplies for this before the boy left, but I just recently got around to finishing the project – and I love it every bit as much as I hoped. 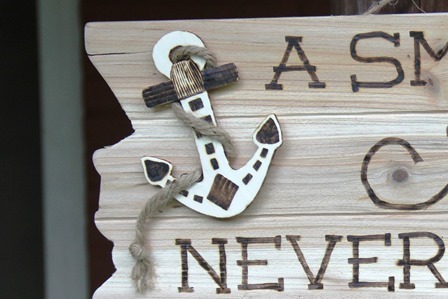 I started with a premade wood sign and a wood anchor from Michael’s. I bought a wood burning tool before our daughter’s wedding and used it for several projects, then put it back in its container, where it’s been ever since. It was fun to give it a go again. I printed most of the words out on regular printer paper, which I cut and pieced together. I wrote “Sea” out by hand. To transfer the words to the wood, I used a seriously old school method – carbon paper. This package is about 20 years old, so that probably tells you something about how often I use it. I taped the paper to the wood and slid the carbon paper under it. After that it was just a matter of tracing each letter with a pencil, which transferred the carbon onto my project. Since it had been a while since I’d used my wood burning tool, not to mention the fact that different wood reacts in different ways, I needed to practice a little. I traced the anchor onto the back of the sign and played around with different tips and temperatures until I was happy with it. As long as I don’t look too long at those two L’s in “skillful”, I like the way it turned out. It looks handmade and a little rustic, and I’m good with that. I gave the anchor the wood burned treatment, then wrapped some rope around it and glued that in place with Elmer’s Glue-All. A couple of clothespins held everything together. After that glue had dried, I glued the wrapped anchor onto the sign. I was a little concerned the glue might not be strong enough, but it’s such lightweight wood that I think it will be fine. So far so good. Having something to hang in my house to remind me of my sailor would have been worth an infinite amount of time and work, but buying premade pieces made this a fun and easy project. Next up, I’m thinking maybe something Italian!